Baby monitors and cameras have become increasingly more advanced compared to the wired, crackly versions from years gone by. Now you can get baby monitors with cameras that see your baby in the dark and ones that let you speak to your baby. 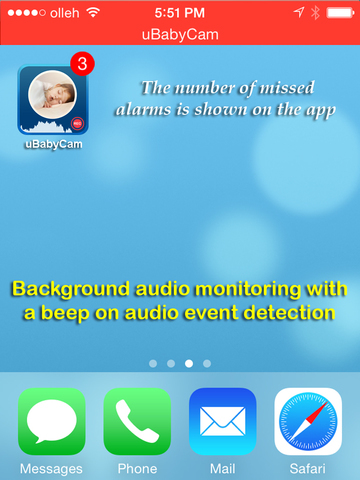 Did you know there are also apps that turn your device into a baby monitor? Here's our list of the best baby monitor apps for the iPhone and iPad. 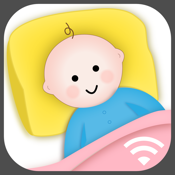 Turn your iOS devices into baby monitors using this awesome app which works over Wifi, bluetooth, and even LTE so you never lose touch with your precious little bundle of joy no matter how sparse the cellphone reception. It also automatically reconnects with the other device in case of a dropped connection. If the devices are disconnected for more than 30 seconds, an alarm will notify the parent unit. 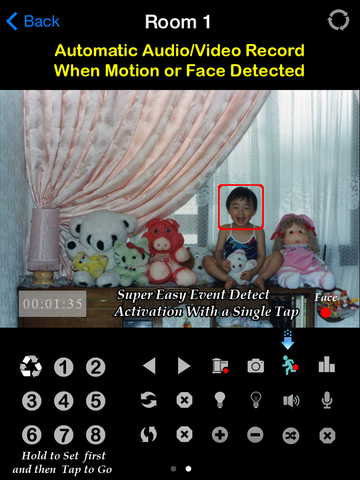 This app works when it is installed on two devices, where one becomes the camera in the baby's room and the other the monitor. Either the front of back camera can be used. This is a free app supported by ads, which can be removed for $3.99. 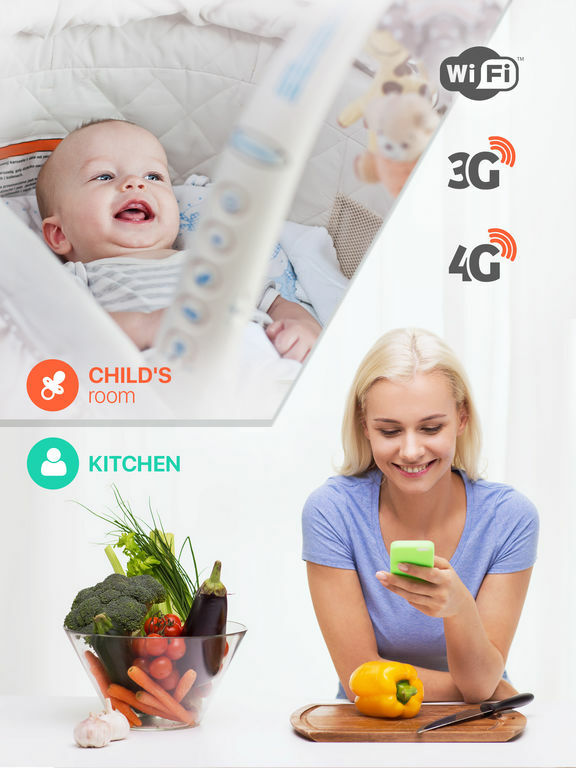 Safe Baby Monitor uses GSM signal which means it has an almost unlimited range. Just put your iPhone near your baby, and when he or she wakes and makes a noise, the iPhone will call a pre-set number to let you know. It can even be a house phone it calls! 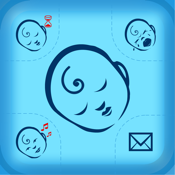 You can choose a lullaby for the app to play, or any music or other media from your Music library. 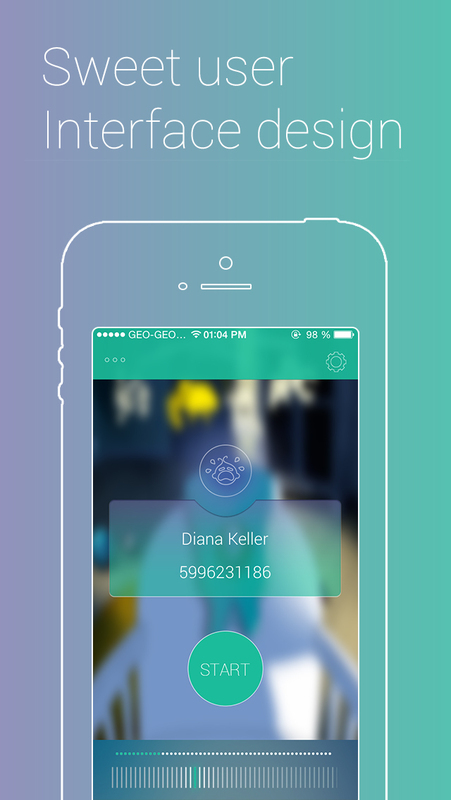 The app offers an Activity Log so you know what happened during the night, you can turn on the Night Light function, and when the iPhone's battery is low, the app will call you. Baby Monitor for IP Camera was created so parents can keep a watch over their babies using their IP cameras. This app is free to try out. You can listen to, watch, and speak to your baby using your phone and either wired or wireless IP cameras. The app supports video recording and unlimited snapshots, password protected access, and alarm notifications. 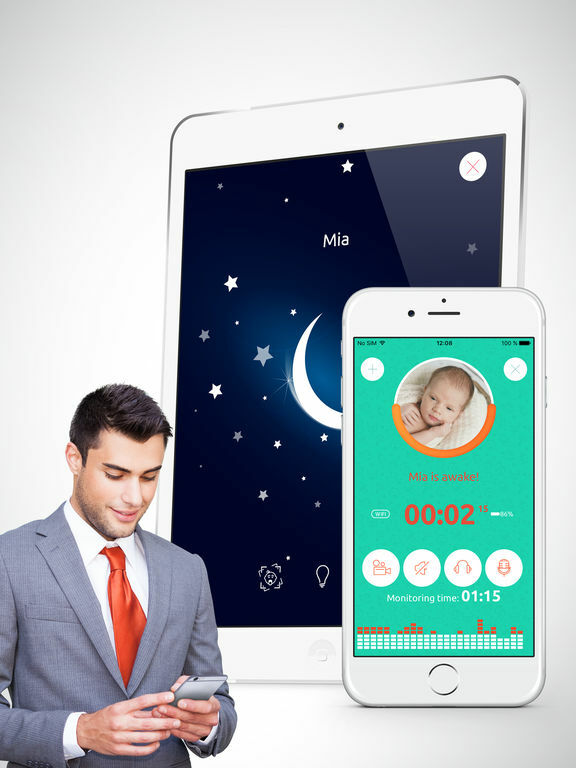 You can monitor your baby in the background while running other apps and if you are away from your phone while the app runs, you can check to see if you missed any alarms. 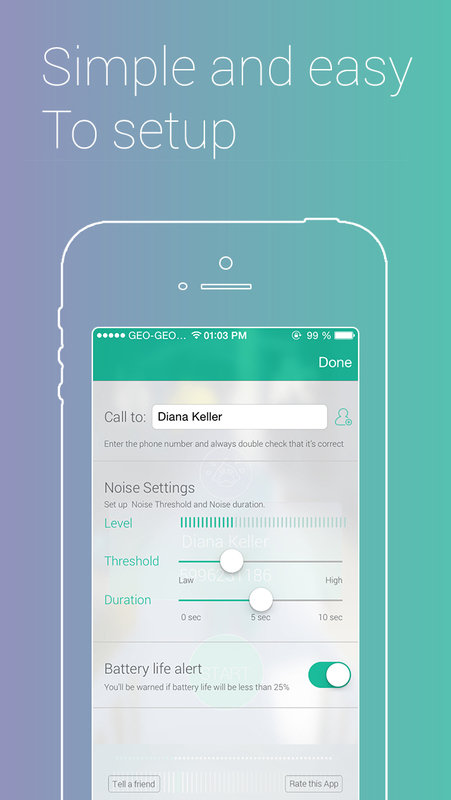 Intelligent Audio analysis helps get rid of false alarms and you can adjust the app's sensitivity to occasional noise. 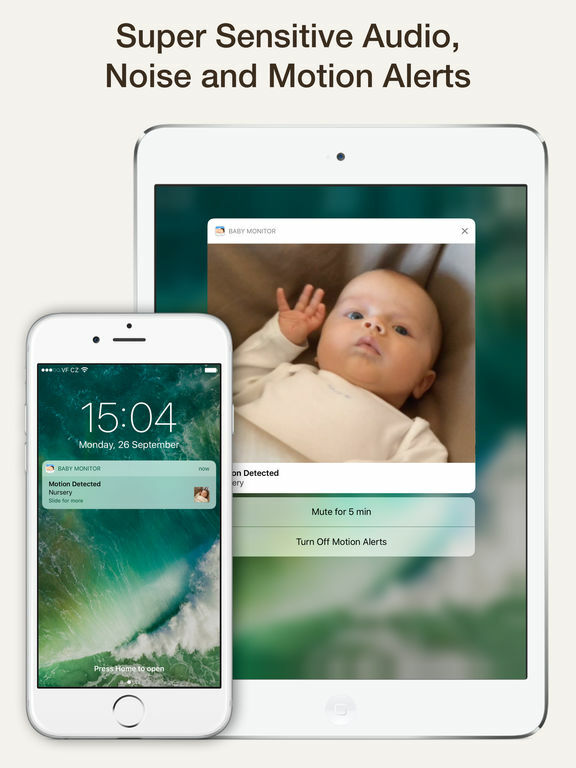 Turn your iDevices into a baby monitoring system through this app. 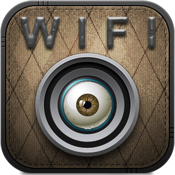 Use your Wi-Fi service to set up the iDevices in the baby’s room, then monitor via another iDevice. The video and audio are high quality. 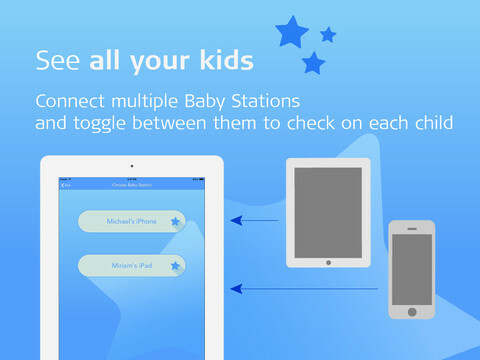 Users can zoom in, tap the night light to see better, monitor more than one child, connect unlimited baby stations to a parent station, connect as many parent stations as you want and much more. There’s an in-app purchase for unlimited monitoring. 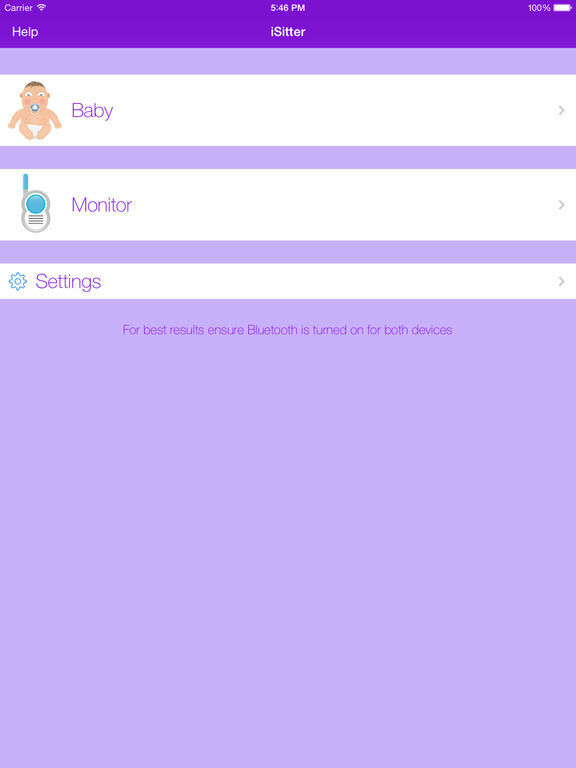 Baby Monitor by Annie has an unlimited range and will work over LTE, 3G, or WiFi. It has support for Apple Watch and you can use it to monitor up to four children from an unlimited number of parent units. The app turns any two iPhones or iPads into monitor units. The offers full-screen video in five different quality levels, reliability, high-quality audio, and the ability to press the microphone button so you can talk to your baby. All communication between the child and parent device is encrypted and if the battery level drops below 10% on the child device, you will receive an alert. 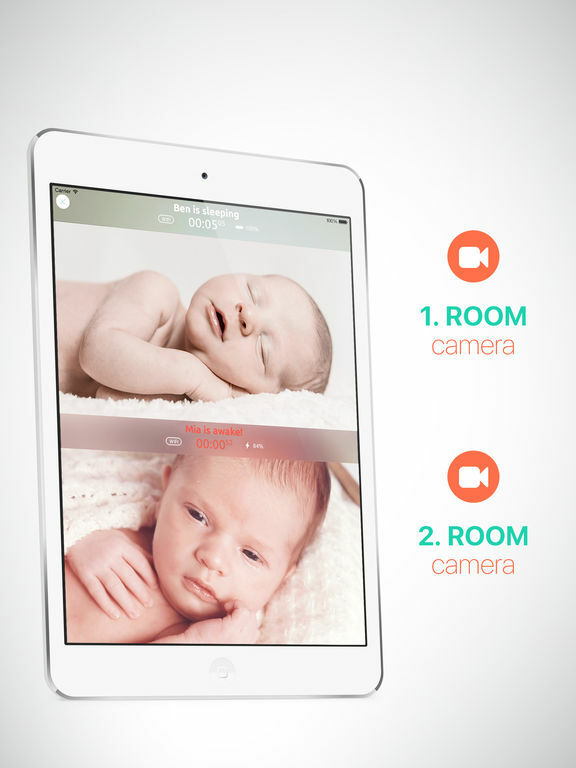 Third Eye Pro turns your device's camera into a baby video monitor. The data received is transferred to your browser, not a server. 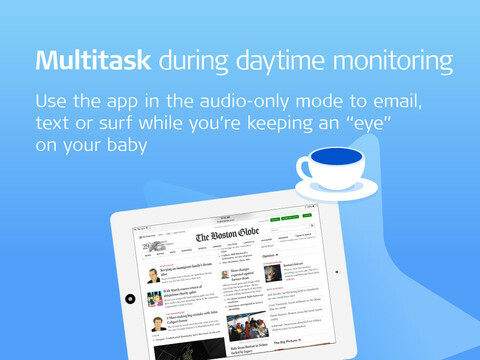 Set up the app and do your work on your computer knowing you can watch your baby. The computer you use must have Microsoft Silverlight for the app to work. The app supports full-screen view video and you can record sound or capture photos using your browser. You can use either camera on your iPhone and you have the ability toggle between cameras from your browser. 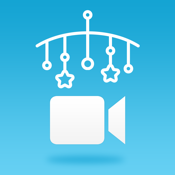 uBabyCam lets you see live video and audio feeds using your WiFi or cellular network. You can monitor your child's movement with a real-time audio graph, pinch to digitally zoom, record audio or video to Camera Roll, and use the Push To Talk option for two-way audio. 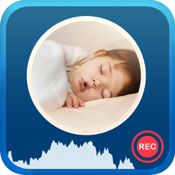 This app lets you analyze sleep patterns, amplify the volume with the audio boost feature, and switch between portrait and landscape modes on the camera. You get a passcode lock, Retina display quality interface, the ability to adjust the light frequency on some cameras, and there is a motion detection and email alarm with adjustable motion sensitivity. 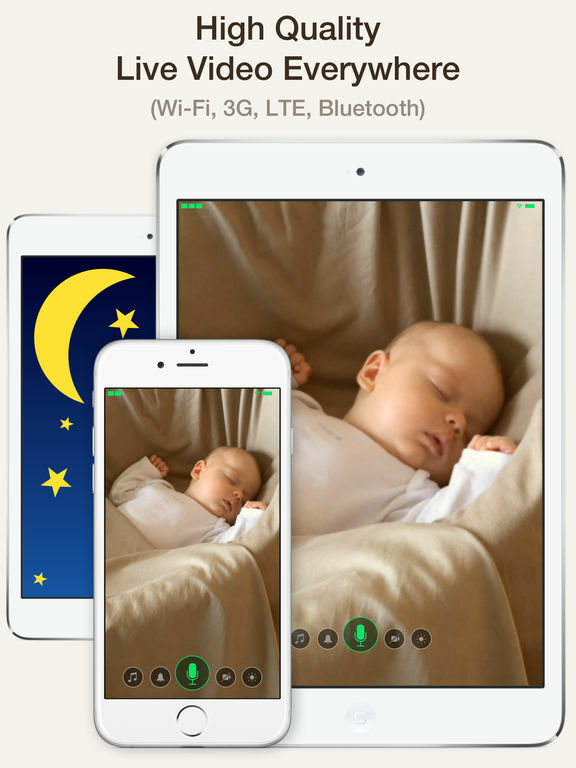 Baby Monitor Lite lets you watch your child using your iDevices. You'll need two: one to act as the child device and one to act as the parent device. Just activate WiFi and connect to a network or use your 3G/4G network. Once you register for an account it's easy to set up each device. You can see and talk to the baby, use the baby device as a nightlight, and if your child wakes or stirs, the parent device(s) will be notified. 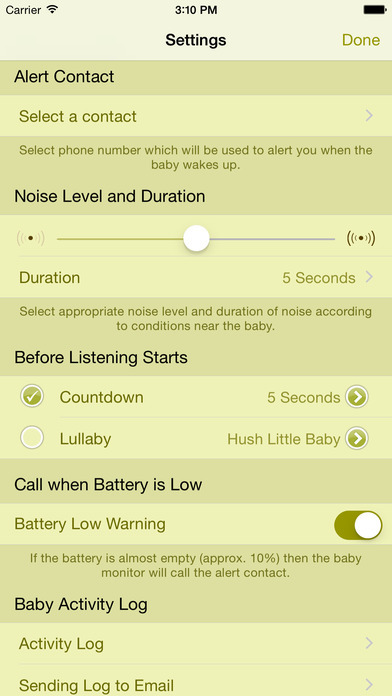 The noise threshold on the baby device can be adjusted in the app settings. Baby Monitor Free allows you to see and hear your baby from anywhere. 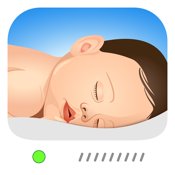 This is the freemium version of the Baby Monitor HD app so you can try it out before you spend money on the app. 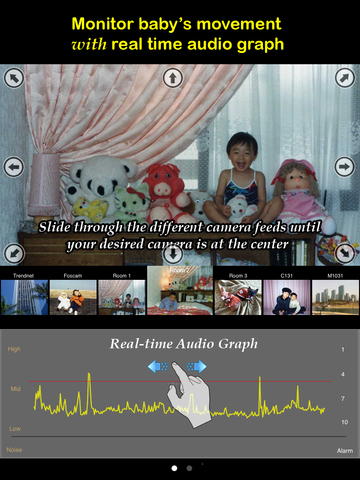 The app offers passworded video and audio signals, double-tap zoom on video, and pan/tilt controls. 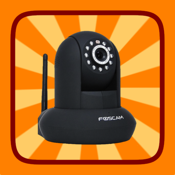 It's compatible with several different Foscam camera models and is in experimental mode with several others. The app is customizable, has quick and easy setup, and offers an active support group. 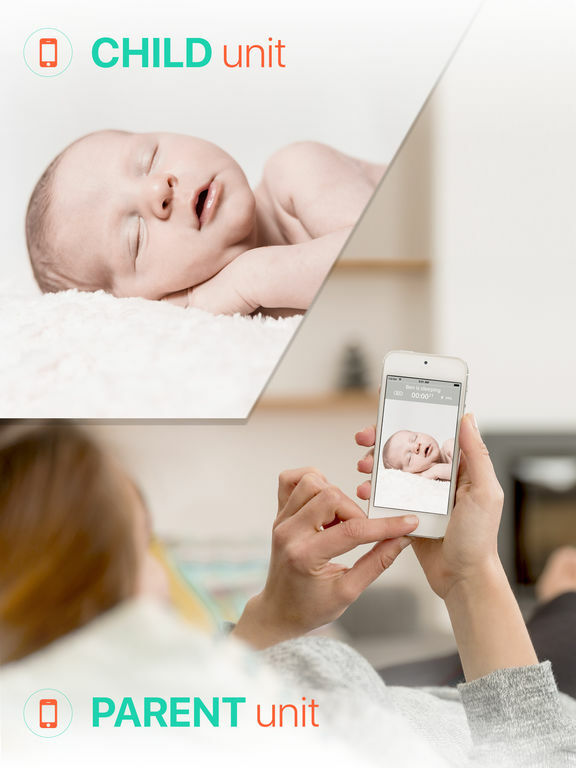 Cloud Baby Monitor uses two devices to let you keep an eye on your baby. You'll get clear audio and video with one device acting as a monitor in your child's room and the other working as a parent unit. The devices will connect automatically with no configuration required. Only you will have access to the video stream thanks to the encryption. You can monitor the feed using WiFi, LTE, 3G, or Bluetooth. 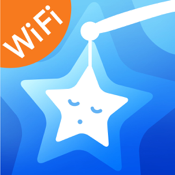 The app includes popular lullabies and white noises and you can create custom fairy tales, white noises, or songs from your iTunes library. If your baby gets upset you can talk to him or her. The app is compatible with Apple Watch so you can get live video, motion, and noise alerts.